Ahhhh, cheesecake recipes. This is one of those desserts that I just adore but don’t eat too often because of the calories. 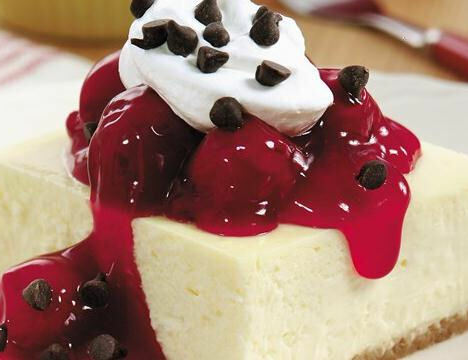 Just by nature, cheesecake screams “I’m going to break my diet.” This lightened up chocolate cherry cheesecake is just a bit lighter on your hips. April 23 is my birthday and also National Cherry Cheesecake day. Find out more about the National Days in April here. I decided to see just how much I could lighten the dessert up without too much of a sacrifice on taste. And I discovered that this one does quite well in that regard. 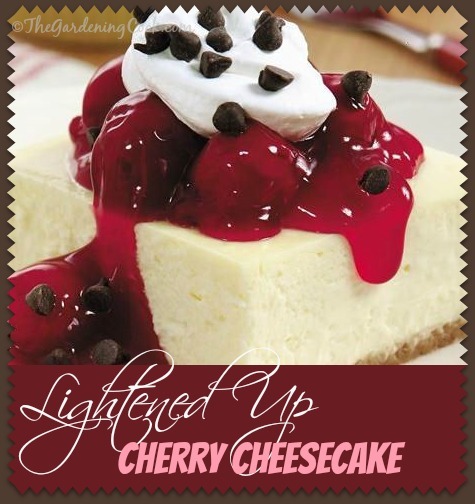 What I came up with was this recipe for Lightened Chocolate Cherry cheesecake is absolutely a must try. I used reduced fat cream cheese and sour cream to save on the calorie count without sacrificing any of the flavor. The recipe is easy to follow, and I love the fact that ingredients needed are just a few. Let your imagination run wild on the toppings. Toffee bits would give it a nice extra crunch. You can use fat free cook whip for extra calorie savings too. And here is a trick: use the mini chocolate chips on top to give more of the delicious bites than the larger one gives. It makes you feel as though you are getting more chocolate. For more delicious recipes please visit my Facebook cooking page. This lightened up chocolate cherry cheesecake has a few substitutes to make it easier on your waistline. Heat oven to 350°F. In ungreased 13x9-inch pan, combine graham cracker crumbs, sugar and butter; mix well. Press crust mixture evenly in bottom of pan. Bake at 350°F. for 8 to 10 minutes or until toasted. Reduce oven temperature to 300°F. Meanwhile, in large bowl, beat the reduced fat cream cheese and sugar until blended. Add vanilla and eggs; beat until smooth. Add in the reduced fat sour cream; blend well. Pour into crust-lined pan. Bake at 300°F. for 35 to 40 minutes or until edges are set and center is still soft. Remove from oven; place on wire rack. Cool 1 hour. Cover; refrigerate at least 6 hours or until serving time.